I just got a tattoo with dark purple, black, green, a little yellow, and a little teal. Would this be removable? I am looking into laser removal and the place I would like to go has a Trinity by Astanza which they claim can remove all of the colors in my tattoo. The tattoo is on my ankle and is about the size of my hand. They claim they can completely remove it. Is this true? Would covering a colored tattoo with black ink work better than Laser Tattoo Removal? I've had 15 sessions of tattoo removal on my rose but it has only faded. I was wondering if I got a black tattoo over the top would it work better? Can tattoo eyeliner be removed? Do you have a list of facilities where the R20 is offered? Do all of your facilities listed offer the R20 method as a service? Is there a way to refine my search for a facility near me by this service? 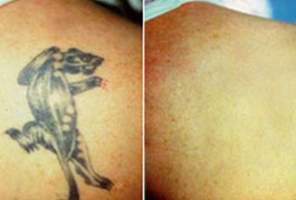 What is the danger of sun exposure after laser tattoo removal? I had a black ink tattoo removed in three phases via laser tattoo removal. My last treatment was performed in March 2012. I'm planning a vacation after three months of healing. Do I need to keep the treated area covered? What do you recommend? Can a diabetic patient get laser tattoo removal without a problem? Can laser tattoo removal be harmful if you are a Type 1 diabetic? Does all natural tribal tattoo ink fade faster than others after laser removal? I would like to remove a rose tattoo that was done with natural ink. I was told it was tribal ink, but I'm not sure what that means. Can this type of ink be removed with laser tattoo removal? Is the R20 method of tattoo removal effective on colors other than black? I have black, red and green ink colors in my tattoo. Will the R20 method be effective in removing the red and green as well as the black ink? Is there more trauma to the skin with the R20 Method? Can the r20 method be used on a tattoo with multiple colors? Is there more truama to skin, and is there scarring? How are results using the R20 method on a muti-colored tattoo? Are results favorable when using the R20 method on a multi-colored tattoo on the foot? I have a colored (3x3 inches) tattoo on each foot that I would like to remove in the near future. Any suggestions from physicians that are using the R20 method? Are all 4 treatments at same settings? Are laser settings changed per treatment much like traditional laser removal? My daughter had a small date put on her wrist just 2 months ago. Is it too soon to have this procedure? Is it safe to remove red ink from the face of an African American? Hi there. I am wondering how "safe" it is to try to remove red ink from the face of an African American. I understand the 532nm wavelength is the correct treatment protocol, yet this isn't typically advised for skin tones over IV. Thoughts? Is the removal process different for a UV/Black light tattoo? Did 3 lasers treatments, faded significantly, but not gone. Will it ever go away completely w/out surgery? Is Medlite c6 a good laser? Is Medlite c6 a good laser to remove tattos? I've had 3 laser treatments on my tattoo which just has dark blue color. It has been 3 years now and it has faded quite a bit. Will it ever ALL go away or will I carry this "ghost" forever? Would 3 more sessions do it?